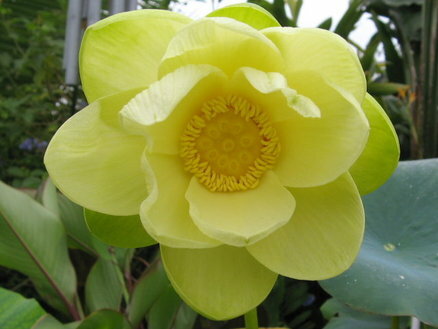 Starting the native American Lotus (Nelumbo lutea) from seed is easy. Start them now in Fall, keep them protected from frost and they will flower next summer. The big seeds need to be nicked, so I held them in a vice and filed carefully until I could see the cream-colored inside of the seeds at one spot. Next, I put them in a glass with warm water on my kitchen window sill, and every time I noticed the glass I exchanged the water with warm tap water. In a few days the seeds sprouted. First I filled the buckets with mucky dirt. I am ‘lucky’ enough to have just that in my yard. Shortly after planting, the first small leaves (silver dollar sized) came up. I added a little of the all-purpose liquid plant fertilizer. 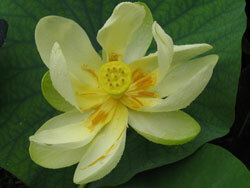 The temperatures dropped in January/February and the lotus babies quickly went dormant. 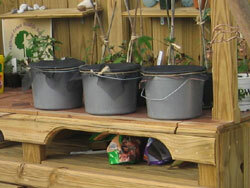 I left them in the sunny location but brought the buckets into the garage during the coldest nights. Soon the first aerial leaves grew. They seemed happy in their buckets, and seemed to like the occasional all-purpose liquid fertilizer. In May I found good homes for two of the babies. 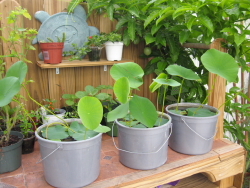 Middle of May my lotus baby was planted into a three-gallon pot and placed in the ‘Salad Bowl’ with a canna, horsetail and water lettuce. Since the lotus is a strong and fast grower, I suggest NOT to release it in your lake, pond, or in the wild, but keep it contained. 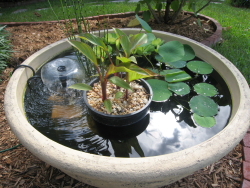 A bubble fountain adds oxygen to the water for some water snails and minnows, they have the job of eating the mosquito larvae. 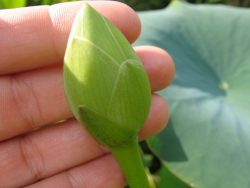 In August, I found the first lotus flower bud! 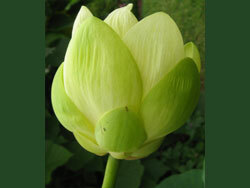 The bud opens up to become a beautiful, creamy white flower. 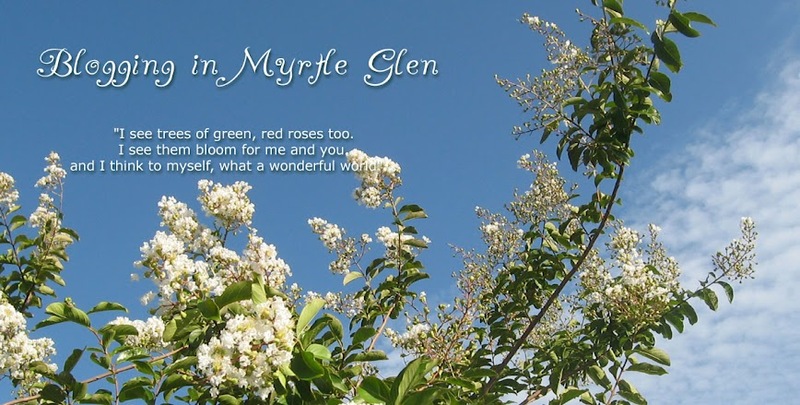 Wow, those flowers are beautiful! 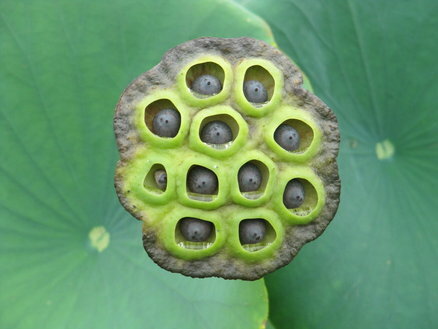 I've never seen the seed pod of a lotus before. Very interesting looking! I love the idea of growing them in a bowl. I would love a little pond but don't really have a spot for one. But a lotus bowl looks really awesome and more easily done! Such a great informative post! Thanks Indie, glad you like it. 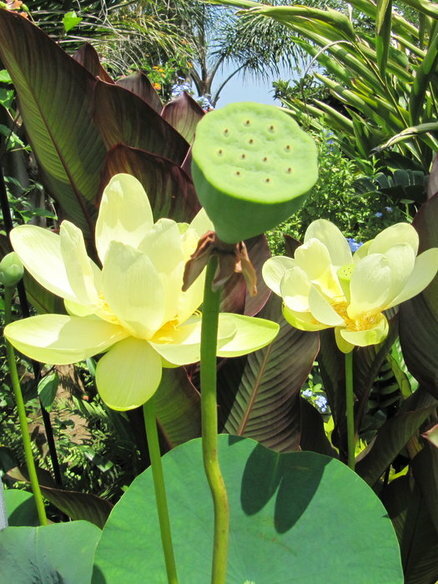 I got the idea from some street plantings (lotus in huge bowls) in Thailand.